I paid a visit to the Land of Ne (Koyene) from which hailed Takahito. He is known as the founding father Izanagi through the 8th century classic, the Kojiki. I was searching for his sister, Shirayama-hime, the lady of the White Mountain. Takahito and Shirayama are both mentioned prominently in the Hotsuma Tsutae, an even more ancient document. The White Mountain, Shirayama, is today called Hakusan. I visited it from Ishikawa-ken in the area on the Japan Sea coast known as Hokuriku, northwest Honshu. It straddles three other prefectures: Fukui, Gifu, and Toyama. 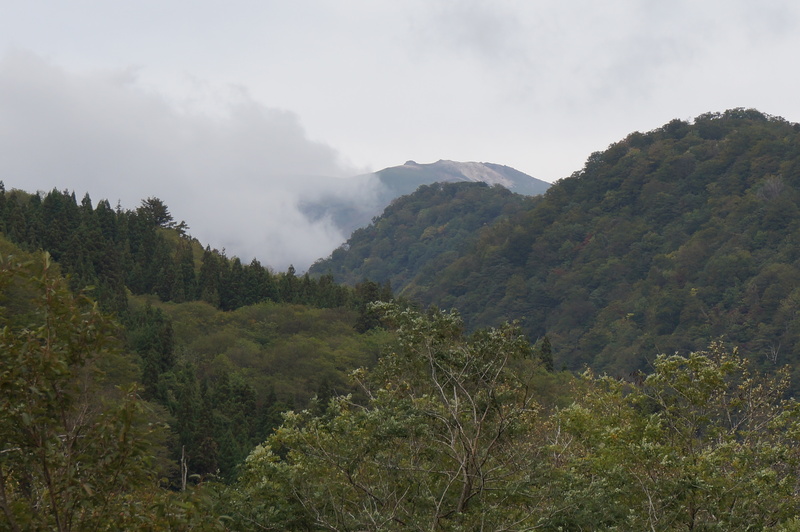 Hakusan is a beautiful mountain range and the center of the Hakusan National Park, shown above. Around its footills, as well as at one of its peaks, there are a number of Shirayamahime jinja associated with mountain faith of Hakusan. Until the 8th century, people did not climb sacred mountains, and this is certainly a sacred mountain. 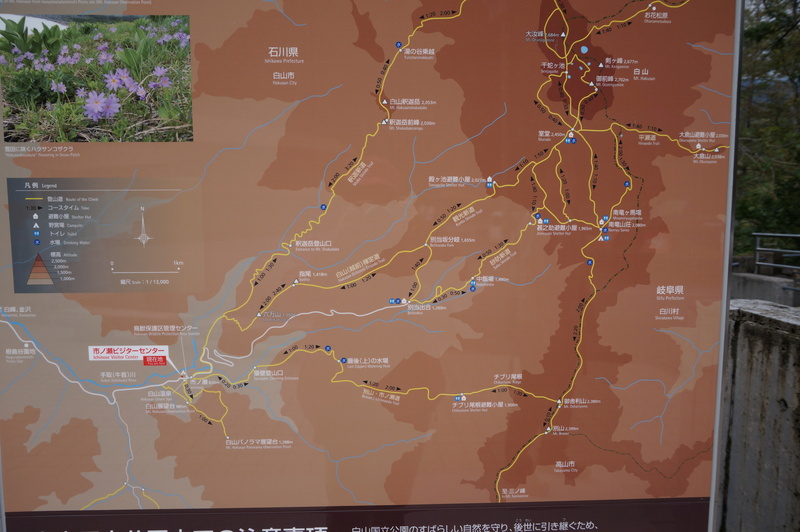 The above map of Hakusan National Park indicates the highest altitudes in dark red-brown shade. This is the Ishikawa west side of the mountains. The other side includes the place of deep snow called Shirakawa-go, part of the ancient land of Hida from Toyama, Takayama, and down to Gifu. I had traveled that route just last year. Our group visited several of these shrines. We found the old mountain shrines most interesting. In this snowy region, they are enclosed within glass outer walls. Sliding doors glide open to allow prayer access to the devotee. 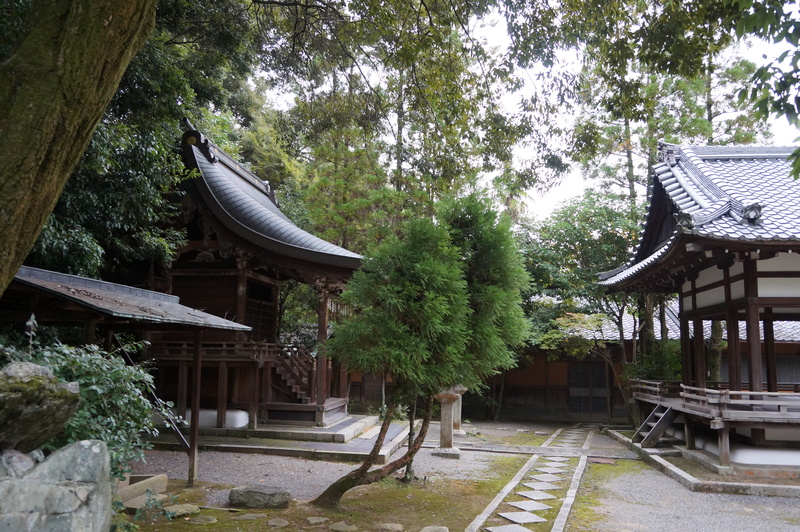 Seoritsuhime, the wife of ruler Amateru, is remembered in several shrines in this area. Both of these hime are regarded as kami of water and of purity. Seoritsuhime is invoked in the Shinto norito of purification and she whisks away one’s impurities into rivers that plunge ultimately into the sea. The national park is popular with mountain climbers and skiers. As we drove up the mountain, we passed through many tunnels and saw many dams. This is a vital watershed area, the source of four great rivers, and produces not only water for drinking and agriculture but also hydroelectric power. Shirayamahime is known also as Kokorihime in Hotsuma Tsutae. In the Nihon Shoki her name appears as Kukurihime which means one who binds. Another name is Kikurihime which means one who hears. As the latter, she is regarded as an aspect of 11-Headed Kwannon who listens and responds to people’s pleas. Shirayamahime appears in Hotsuma Tsutae in Ayas 1, 4, and 24. In the former, when her sister-in-law Isanami gives birth to Amateru, Shirayamahime is the one who gives him his first bath. She is Amateru’s aunt. Shirayamahime is the first to hear the infant speak his name, Uhirugi, spirit of the sun. For this she was called Kikurihime, although at other times Kokorihime. Aya 24 tells about Ninikine’s travels, by palanquin provided by Ukesuteme, through the Shirayama peaks in the Land of Koshi (Koyene). Together with Ukesuteme, Shirayamahime studied the secret teachings of To no Woshite with Lord Toyoke in his palace in Hitakami. Ukesuteme is the original name of the immortal Mother of the West, Xi Wangmu to the Chinese. This leads me to suspect that Shirayamahime and Ukesuteme may have been masters of The Way and possibly acquired supernatural abilities. While Shirayama is the name of the hime, Hakusan has become the name of the mountain and the mountain faith. Interestingly, the hongu main shrine in Kanazawa City is called Shirayamahime Jinja while the okunomiya mountain-top shrine is Hakusan Jinja. White Winds of Autumn. Matsuo Basho preceded me here on his famous trip chronicled in Oku no Hosomichi. He was at the famous Natadera Temple in 1689.
whiter than the stones of Stone Mountain are the winds of autumn. Grasshopper in the Helmet. When I visited Tada Jinja in Komatsu, I learned that Basho had also been here and is memorialized at his own shrine within the Tada shrine grounds. Tada Jinja possesses the elegant helmet of Saito Sanemori, a famous warrior of old. Basho, as he did in his natsugusa ya haiku, expresses his sadness at lives lost in battles. grasshopper under the helmet how tragic! It’s been said that there are 3,000 shrines affiliated with Shirayamahime, Hakusan, and Kukurihime. Of course, many of them are in the land of Ne. We visited a number of them and you can read about them at our sister site: www.yamanomiya.wordpress.com. What have I learned from this trip? Something about the preciousness of human life and the courage of those living in harsh yet beautiful environments. I could see that people nevertheless deeply appreciate the gifts of nature such as the mountains which are home of kami and the source of pure water of life. 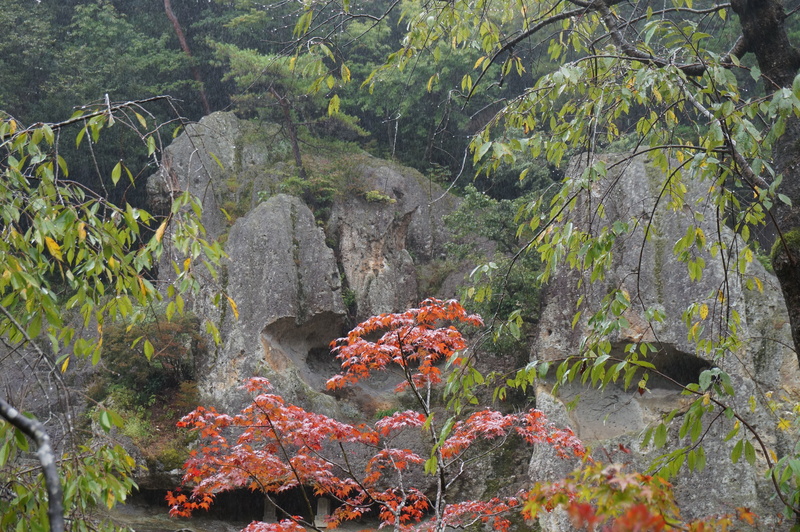 This entry was posted in Hokuriku, Hotsuma, Mountains and tagged Basho, Ishikawa, Shirayamahime on 2014/10/18 by Okunomichi. I have been searching for Rengetsu for two years. The Edo-jidai poet (1791-1875) saw the Meiji restoration usher in a new world in 1868 when she was 77 years old. She wrote this commemorative poem, translated by John Stevens. It is indeed timeless and could be speaking to us today. Hear the timeless cry of a young crane — It is an ode to the dawning of a new age to last 1,000 generations. Last year, I visited Chion-in Temple where she lived with her adoptive father Otagaki. As I strolled the vast grounds, I wondered which building did Rengetsu live in. Out Arashiyama way, she spent some time at the Nonomiya Shrine where princesses trained as saigu. She lived in the Okazaki district of Kyoto, known for the Okazaki Shrine. Rengetsu spent her final years making pottery at the Jinko-in Temple. A second book on Rengetsu has been published by John Stevens. If the first one was good, this one is even better. There are more details about Rengetsu’s life and a large collection of her poems in Stevens’ inimitably sensitive translations. I have just returned from my second Rengetsu trip and this is my report. I was in Kyoto the day before the autumn equinox and the faithful higanbana flowers were in vermillion bloom. The earlier book mentioned that Rengetsu, who could not afford to buy good clay from Shigaraki, would dig for clay in Kaguraoka hill. As I pondered the location of Kaguraoka, (probably near Okazaki), I came across a map showing the Munetada Shrine located on Kaguraoka road. The green area is Yoshida mountain, the site of Yoshida Jinja. At the Munetada shrine, a staff member confirmed that clay was found there. Kaguraoka is within walking distance of Okazaki to the south. My Kyoto friend learned that Kyoto University found some artifacts when ground was being dug for the new hospital. 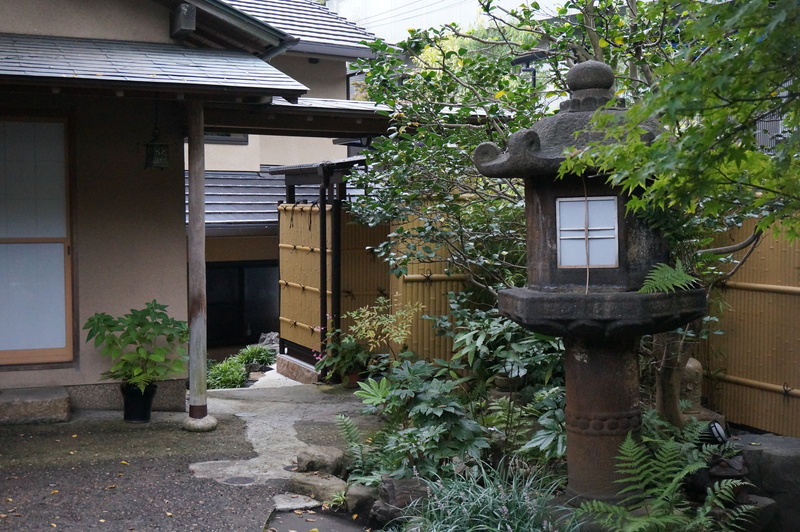 Among them were Rengetsu pots, found where the CAT-scan center is now located, and it is said that she once lived there. This friend well knew the name of Rengetsu since her chado tea ceremony teacher has a number of Rengetsu teacups, and there had been a Rengetsu exhibition at the Nomura Museum. 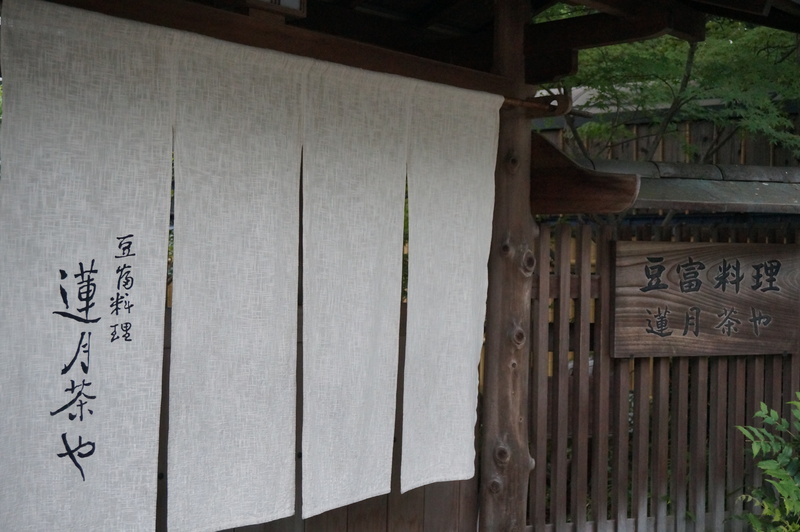 My friend learned that there is a Rengetsu Chaya, a tea shop, on another site where Rengetsu lived. It is on a charming street near Chion-in. In the yard of the chaya is a huge camphor tree. Perhaps Rengetsu knew this tree. The tea shop was closed at this hour of late afternoon, since they serve tofu dishes for lunch. We peeked into the yard and found it to be quite lovely. Here are some photos. We decided to walk over to the Chion-in temple and look for Makuzu-an where Rengetsu lived, according to Stevens. 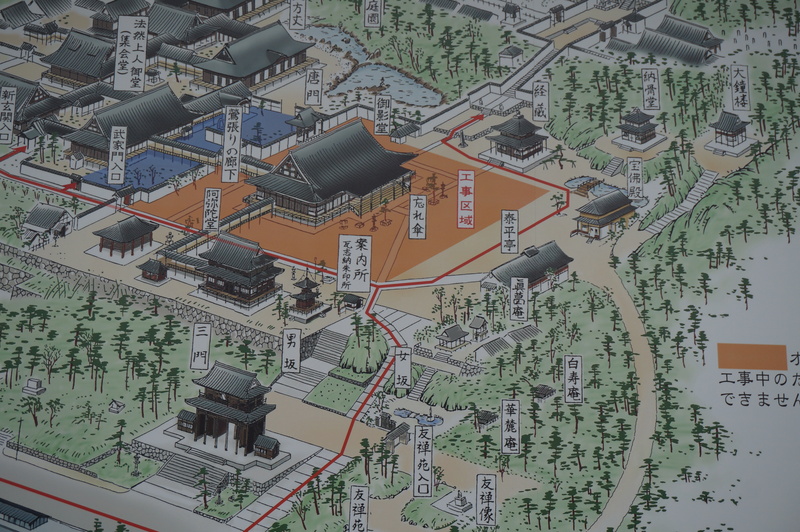 We studied the map of the temple grounds, seen here in closeup. And we saw Makuzu-an! The name appears on the roof of the large building in the center, while the twin buildings of Makuzu-an are seen below it. So we entered the grounds and inquired. As we neared it, a dozen or more people were leaving. They apologized that the building was closed to visitors that day since they were preparing for a tea ceremony the following day and invited us to return. Knowing that we would not soon return, I took some photos. I was here last year! I remembered the kagura stage and the shrine building. Rengetsu’s building is behind them, with the shiny roof. Once again, the first autumn colors on the momiji were beginning to show. of the days of autumn. Thanks to John Stevens Sensei for these translations. This entry was posted in Kyoto and tagged Rengetsu on 2014/10/12 by Okunomichi.